Last week we had a visit from our Minka-Lavery rep, Steve Saks, along with our Eastern Regional Sales Manager, Jimmy Norris. 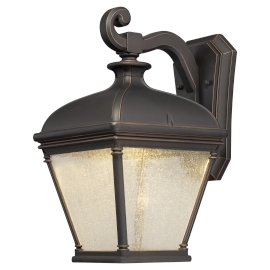 With them they had a sample of Minka's new LED Exterior Lantern family called Lauriston Manor. I LOVE that this series uses LED technology, but it's styling is more traditional than what we usually see in LED. I live in a 1978 split-level, and I can totally picture these on my house! This is the largest wall-mounted size ~ #73293-143C. It's 9" wide by 15.75" high and uses one 8-watt LED module. The color temperature (2700K) is absolutely gorgeous, and it throws light around the sides much more than I would have expected. This is the matching post lantern #72396-143C. It's 9" wide and 17.75" high and also uses the 8-watt LED module. 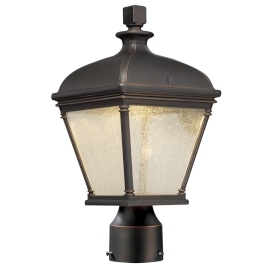 They also make 2 smaller wall-mounted lanterns ~ #73291-143C is 5.5"w x 10"h and #73292-143C is 7"w x 13"h. All four pieces in the family use the 8-watt LED module, 2700-Kelvin. Minka says "Lauriston Manor offers a fresh interpretation of a true classic design. Recessed LED lighting dances against the Clear Seeded glass creating a truly unique display that is sure to last as a timeless expression of personal style." The finish is Oil Rubbed Bronze with Gold Highlights. They go on to say "Beautiful illumination with an environmental advantage. Without compromising style, our LED lights supply a 3000% energy savings over comparable incandescent bulbs while providing a life span in excess of 25,000 hours." 3000%! Amazing!